“In terms of media, I find myself increasingly drawn to clay mixed with other materials -- welded steel, wood, stone, bone, found objects, etc. The use of juxtaposed materials is often more responsive to creative impulse than clay used alone. This is particularly the case when trying to create a sense of dialectic or opposition as is central to my work. Clay continues, with its pleasures and pain, to be my preferred medium. Frustration with its cumbersome nature is outweighed by clay’s inherent ability to capture raw tactile energy. I enjoy walking into new situations cold without preconceived ideas, sketches, tools etc. to see what happens." The work of artists Charles and Fulden Sara-Wissinger opened at Coastal Bend College Simon Michael Art Gallery in Beeville this month. The collection, which includes drawing, paintings, sculptures, and earthenware, showcases the diverse work of this husband and wife team. 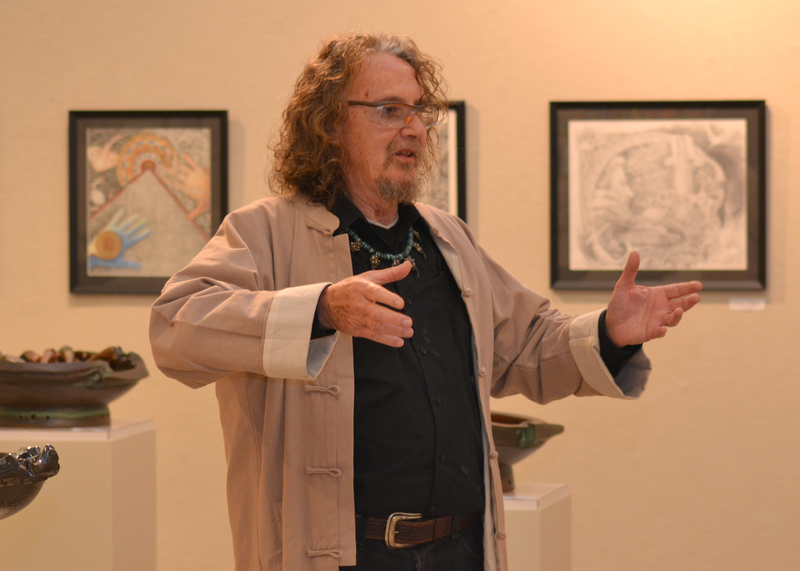 Charles Wissinger, an art professor at Texas A&M University – Kingsville, pointed out the Mesoamerican symbolism found in his drawings. “I am intrigued by North American cultures interaction with nature and our simplistic understanding of what it is to be human,” he said. Wissinger is a graduate of Ohio State University, Columbus, with a Masters Degree of Fine Arts in Ceramics with a minor in sculpture and photography-cinematography. He earned a Bachelor of Science Degree in Art Education from Indiana University of Pennsylvania, Indiana, Pa.
His work has been exhibited across the country and in Canada, Mexico and Turkey. He has been a part of international shows in Scandinavia, including the 1994 International Olympics Ceramics Exhibition in Lillehammer, Norway. “If I never made another image it would matter very little. Stature gained, as an artist, however, has allowed me to affect my world in quite meaningful ways. As an artist I can serve as healer, community builder, and an ambassador. With my art ego checked and no axes to grind, I, as an artist, can move through our segmented society more easily than most, to function as a bridge builder. This requires every bit as much creativity as the self-indulgent act of art making,” Wissinger said. "I attempt to reflect this in my work by fusing together visual elements that have opposing qualities thus creating harmony out of dissonance. Circumstance dictated that I live in a very controlled closed environment for much of the time. With two working parents, no close relatives, and few friends I spent much of my time alone overlooking the magic below, the chaotic jostle of customs, cultures and religions rubbing against each other." Fulden Sara-Wissinger is an adjunct professor at TAMUK. She also teaches at Coastal Bend College – Kingsville Campus. She earned an MFA in 3D Studio Art from the University of Texas Pan-American in Edinburg and a Bachelors Degree in Graphic Design from Marmara University in Istanbul.“Some of my most vivid memories are of emerging from my sheltered home to walk hand-in-hand with my parents through Istanbul’s world famous bazaars. I became swept up in the sensual soup of sights, smells and sounds — a magical world far removed from my seven-story perch. It has taken quite some time and living half a world away for me to realize just how profoundly this dichotomy has shaped me,” Sara-Wissinger said. She said her heritage is “European mixed with Byzantine and Seljuk-Ottoman Culture.” Her experiences have heavily influenced her work. “As a person of mixed culture, I am fascinated by other cultures. Living in one of the world’s most exotic cultural crossroads created in me a delight for such diversity, and a hunger to venture into the world to experience ever more,” she said. “Wissinger & Wissinger” will close on April 12. The Simon Michael Art Gallery is located in the Frank Jostes Visual Arts Building at Coastal Bend College in Beeville. 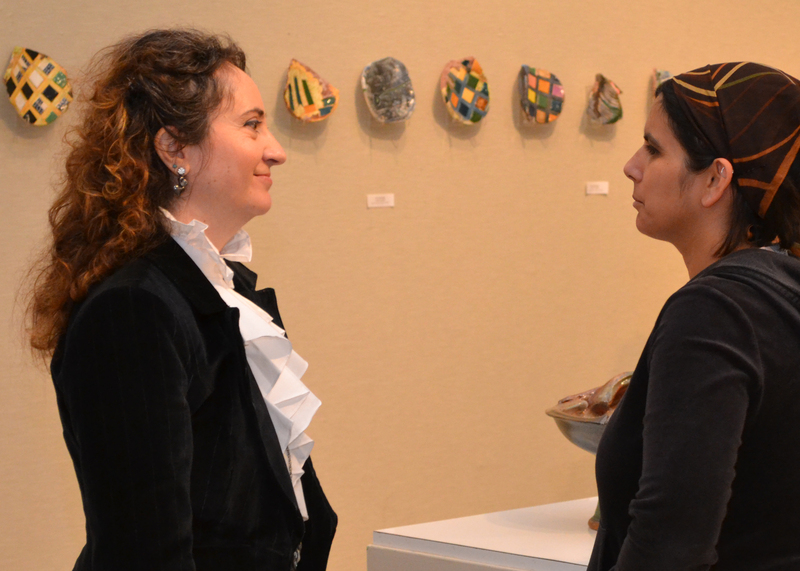 For more information on upcoming shows and CBC’s visual arts programs, go to www.coastalbend.edu/finearts. For more on Charles Wissinger, go to www.chuckwissinger.com. For more on Fulden Sara-Wissinger, go to www.fuldensarawissinger.com. Reblogged this on Modern Underdog Blogspot.